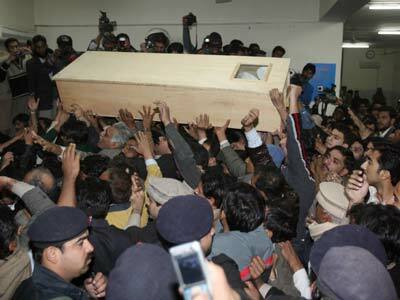 The body of assassinated former Premier Benazir Bhutto [Images] was on Friday flown to her ancestral village in Pakistan's Sindh province where hundreds of her supporters converged to attend the funeral following a night of violent protests across the country against her killing. The body was flown in a military aircraft from Rawalpindi's Chaklala airbase to Sukkur, from where it was ferried by a helicopter to Mohenjodaro, near her ancestral home at Naudero village. Bhutto's husband Asif Ali Zardari and their three children -- son Bilawal and daughters Bakhtawar and Asifa, who flew in from Dubai last evening, accompanied the coffin from Rawalpindi. The former prime minister's estranged sister-in-law Ghinwa Bhutto and niece Fatima too joined the family in mourning at her native village. Hundreds of supporters of Bhutto's Pakistan People's Party drove in convoys to Larkana, the Bhutto family's main stronghold in Sindh, to attend her funeral later in the day. Bhutto will be buried next to her father Zulfiqar Ali Bhutto at the ancestral graveyard in Garhi Khuda Buksh. Pakistanis shocked by Bhutto's assassination by a suicide bomber -- who shot her and blew himself up near her vehicle after she had addressed an election rally in Rawalpindi on Thursday -- poured out on the streets for angry protests across the country last night. At least eight people -- five in the southern port of Karachi and three in Lahore [Images] -- were killed in firing and many more injured in the protests. Anti-Bhutto army factions behind murder?